Rudy Austin, who scored with a spectacular volley for Leeds United against Watford. 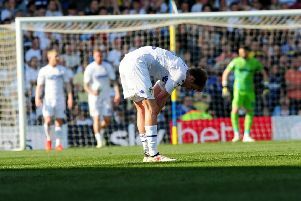 Leeds United failed to make the most of a dream start as they threw away a two-goal lead to lose to promotion chasing Watford at Elland Road. A gift goal for Billy Sharp and a wonder strike by Rudy Austin had the Whites two up in the first 20 minutes, but they lost 3-2 as Troy Deeney began Watford’s comeback before half-time and Matej Vydra struck twice after the break. United could not have wished for a better start as six minutes in Luke Murphy’s through ball was cut out by Watford defender Ikechi Anya, but his header back to keeper Heurelho Gomes could only be parried. The ball ran loose and Sharp, surprisingly picked up front with Steve Morison injured, pounced for his fourth goal in Leeds colours. Gomes needed two attempts to save a Lewis Cook shot from range and Leeds doubled their lead on 19 minutes when Austin chested the ball down on the edge of the box before hitting a volley that flew over Gomes into the top corner of the net for a goal that really lit up Elland Road. United remained on top and could have had a third, but Scott Wootton miskicked when well placed in the box. Watford carried little threat in the first half-hour, but that all changed and they gave the hosts warning of what they could do as right-back Juan Carlos Paredes got forward to fire in an angled shot that keeper Marco Silvestri could only parry. The ball then bounced back into the grateful keeper’s arms off Sol Bamba. Watford got their lifeline six minutes before half-time when Deeney got in behind the United back line and proved too strong for Liam Cooper before planting a shot past Silvestri for his usual goal against Leeds. Deeney then hit a 20-yarder over and only a good block by Bamba kept the Whites ahead at the break. Leeds made a flying start to the second half and could have added to their tally within seconds of the restart as Sharp put Austin clean through only for the Jamaican to see his shot saved by Gomes. From the rebound Austin quickly hooked in a volley, but the ball was cleared off the line by Gabrielle Angella. Seconds later Sharp failed to make good contact on a near post shot then Murphy hit a shot just over. But Watford survived the pressure and hit United with a sucker punch on 56 minutes when Almen Abdi sent Deeney through and his low cross was turned in by Vydra to make it 2-2. If the visitors were fortunate to be level at this stage, there was no doubt they were the better side for the rest of the match and looked much more likely to grab a winner. Vydra went round Cooper only to see his shot saved by Silvestri then Ben Watson sent a shot just wide from the edge of the box. Abdi was the next to get round a home defence playing too high a line, but his angled shot went just side. It seemed the more Leeds committed players to attack the more stretched they were and open to counter attacks and the best they could muster was two Alex Mowatt shots from distance that never threatened to go in. United failed to heed their warning and after Murphy lost the ball in attack Watford quickly broke forward to score their winning goal 10 minutes from time with Vydra racing onto Abdi’s through ball. His initial shot was well saved by Silvestri, but he beat Bamba to the rebound to get the ball in the net to make it 3-2. Leeds did exert some late pressure as they looked to get an equaliser, but their opponents survived a couple of goalmouth scrambles and it was all over when Murphy volleyed over from the edge of the box in added time. United head coach Neil Redfearn did not disguise his disappointment after the game. He said: “You can’t afford to defend like that. They are a good side and we can’t gift good sides opportunities. We didn’t defend well. “The way they play you are going to get one v ones and you need to make good decisions. Today we didn’t make good decisions. “We started well and then for some reason the back four took a step back. If you give good sides space then you end up getting the runaround a little bit. “We actually played quite well. We were two up and looked like we were going to score, but it’s like when you’ve got a boxer on the ropes you’ve got to finish them off. If Rudy Austin’s shot goes in at the start of the second half it could have been a different game at 3-1. Leeds: Silvestri, Wootton, Bamba, Cooper, C Taylor, Byram (Cani 90), Murphy, Cook, Austin (Adryan 73), Mowatt (Antenucci 84), Sharp. Watford: Gomes, Paredes (Hoban 90), Cathcart, Ekstrand (Angella 42), Anya, Tozser, Watson, Abdi, Layun (Munari 52), Vydra, Deeney.